Posted in Misc and tagged bridge, Irish Rail at 12:28 pm on April 27, 2016 by Broadsheet. Update – the cars are back and the signs are gone! Parked on the footpath? What did they expect? You can’t just randomly park your car anywhere you want any more. There are clampers everywhere now, public and private. Yes, it doesn’t seem excessively surprising that, if you park in an area where there is a notice saying you could get clamped, you run the risk of getting clamped. I’m pretty sure according to bye laws, you can park on footpaths as long as 3 or more wheels are on the pavement and you are not obstructing use of the pavement. you can get keyed though. 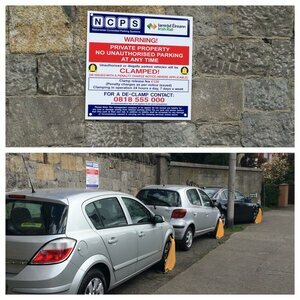 Looks like NCPS clamped them actually. 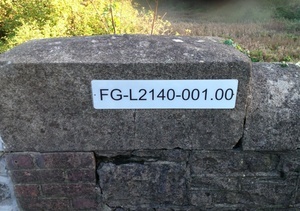 Irish Rail and emergency services need access to bridges for maintenance and emergencies. I do object to clamping in general though. It can’t be constitutional. Slam them with the fine instead. Why can’t it be constitutional? I’d love to see it come up in court though. I don’t like clamping, either but I’m not sure that’s true, though. What part of clamping it is illegal? There was a “legal eagle” on Newstalk a good while back, when Leo Varaka had transport & was talking about regulating private clampers. He gave an opinion that while it was illegal to trespass (park on private property) it “may” have been a greater crime to prevent a trespasser willingly leave your property (by clamping them), so perhaps in that case, cutting off the clamp could be okay. He reckoned it would have to be tested in the courts to get the answer. I haven’t heard of anyone taking that case yet. The vehicle bearing the identification mark , having been found to be parked [state nature of parking] in contravention of a prohibition or restriction under * section 35/* section 36 of the Road Traffic Act, 1994 , has been fitted with an immobilisation device by the undersigned *being an authorised person/*acting under the direction of an authorised person for the purposes of section 101B of the Road Traffic Act, 1961 . That relates to parking on roads/footpaths etc. not private property. I my vastly inexperienced legal opinion, the difference is public road v private property. I don’t think you can trespass on a public road and Section 36 of the Road Traffic Act doesn’t apply to private property. 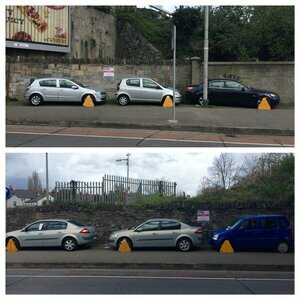 CIÉ are allowed to set bye-laws on their property, and the Vehicle Clamping Act 2015 amends the Transport Act to allow them set charges for the removal of clamps. Parked on a footpath by the looks of things. I support crushing these cars into tiny little pieces. They don’t do the annoying and difficult to remove sticker on the drivers window anymore? Alternatively, buy an actual clamp, park anywhere you like and affix said clamp. When you return to your vehicle unlock your clamp, place it in the boot and drive off. Selfcongratulate for getting away with being an antisocial twerp. I like, but I imagine those clamps are expensive. Yo bros, how’s it clampin’ ! It’s clamp this, clamp that budda climp, budda clamp! For an alternative approach go to Youtube and search Homer Simpson wheelclamp. All those cars belong to a garage in the lane beside bridge. That garage has parked cars there for years and years. I wonder why now all of a sudden Irish rail have done this. Doesn’t matter. It’s their land. He has a nice Mini I’d love to buy. Who said it was Irish Rail who instigated this? NCPS are renown for their sharp practices. Anyone know what the connection between NCPS and parkbytext.ie is? They are two separate companies yet the same people answer the phones for both. 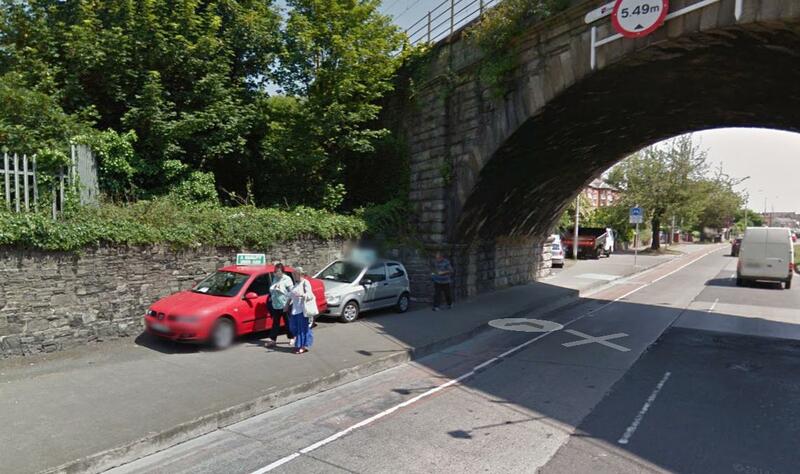 If this were up to the city or county councils they would never bother taking action (I’m looking at you Naas Road – full footpaths of cars for sale).